As a young woman in her twenties, I pity so many teens and pre-teens for missing out on a great era of young adult books I grew up with. When I was in middle school, I was a fervent fan of the “Roswell High” books that were penned by Melinda Metz. Her books were coupled with intrigue, romance and adventure. Even though she had a young audience, she wrote with sophistication and didn’t dumb down her style unlike some authors who shall remain nameless ( Stephenie Meyer and E.L James). If you’ve never read the “Roswell High” books, maybe you’ve seen the show it was based on? Remember in 1999 when the WB premiered an awesomely romantic Sci Fi show called “Roswell”? Roswell was based on the first “Roswell High” book from Metz’s book series. We all should thank Melinda Metz for introducing Max Evans ( played by Jason Behr) into our lives. After 10+ years of the TV show being off air , Metz still continues to write young adult books and teaches English courses. I was super lucky enough to snag an interview with her a few weeks ago on her past and present writing experiences. She also had interesting things to say about her time as a staff writer for the TV show “Roswell” during its third season. Sherryn: I read somewhere that Laura Burns hired you to write the “Roswell High” novels? When it comes to fleshing out the storylines, character development, and overall plot, what were your contributions to the novels? Melinda: Yes, Laura Burns was my editor for the books. Pocket Books wanted to do a series called “Roswell High” that involved teenage aliens. They hired the company Laura worked for, 17th Street Productions, a book packager (now Alloy) to develop the idea for them. Laura came up with the six main characters, their relationships, that the aliens came from pods left behind by the Roswell Incident crash, and the big overarching plot. I believe it was about a 4-page proposal. Then once I was hired, Laura and I (who were already friends and had been editors together at another company) worked to flesh out the storylines. I filled in more specifics when I wrote the chapter-by-chapter outlines and then even more as I was writing the books. Sherryn: Even though Max had blond hair and blue eyes, and Liz Ortecha was native american, was it your idea to make these characters so different? Melinda: How do you feel about the TV portrayal of these star-crossed lovers? I didn’t have anything to do with the casting or with the show until the third season when Jason Katims hired me and Laura (we’d become writing partners by that time) to be staff writers for the third season. I thought Jason Behr and Shiri Appleby had amazing chemistry and were a perfect Max and Liz. Sherryn: Can you tell me more about your background as a writer? Melinda: I was an editor for seven years before I made the switch to writing books. The first book I wrote was a novelization of an episode of the Goosebumps TV show (an episode that was already based on a Goosebumps book!). The Roswell High books were my next project. At times I still can’t believe they were turned into a TV series. After that I wrote a book series called Fingerprints (part of the series was reissued under the title Echoes). Then Laura and I teamed up and wrote and sold two TV pilots, and worked on the staff of Roswell and Missing (a show based on Meg Cabot’s 1-800-Missing series). Laura and I also wrote several TV tie-in books for the Everwood and Buffy the Vampire Slayer shows, an Edgar nominated middle-grade mystery series called Wright and Wong, and, most recently, Crave and Sacrifice, a pair of vampire YA novels. I also wrote a YA horror novel called Raven’s Point. Sherryn: Aside of “Roswell High”, you wrote some “Everwood”and “Buffy the Vampire Slayer” books. Which was your favorite? Which was the hardest book you had to write? Melinda: I think my favorite aside from Roswell High was the Wright and Wong series. Laura and I had a lot of fun with that series, and we worked hard to create a character with Asperger’s who felt authentic. I can’t remember which was hardest too write. Maybe it’s like what they say about childbirth (I don’t have kids, so I don’t actually know)–that you forget the pain once it’s over. Sherryn: What inspired you to write the “Fingerprints” and “Paranormal Girl” series? Melinda: While the TV rights to Fingerprints were sold and a pilot was written, it was never called Paranormal Girl. That was, I believe, I a different pilot. I don’t know how they got connected, but I never worked on anything called Paranormal Girl. Fingerprints was another book project I did with 17thStreet (now Alloy). I worked with another awesome editor, Liesa Abrams, who came up with the idea of a girl who touches a fingerprint and knows what the person who left the print was thinking at the time they left it. She and I took that concept and worked out the storyline together, much the same way Laura and I worked on Roswell High as editor and writer. Sherryn: Where did you grow up? Go to school? What inspired you to become this amazing writer? Melinda: I grew up in San Jose, CA, went to Willow Glen High School, and majored in English at San Jose State. I always loved to read. (Well, almost always. My mom claims she tried to teach me before I started kindergarten, but that I had no interest in either that or learing to write my name.) Because of my love of reading, I wanted to work in publishing, and I found being an editor really rewarding. After several years though, I began to want to try working on the other side and took the plunge into freelance writing. Sherryn: Do you have any advice for writers getting into the industry? Melinda: Tough question, because I got into it sort of sideways by starting out as an editor. I’d say–write the best book you possibly can and don’t worry about agents or editors until you do. Don’t send it out until you feel like it’s as close to perfect as you can make it. Find a few people you can trust (doesn’t matter if they are writers as long as they are readers) and get them to tell you what they think. If you get the same comment a few times, think seriously about doing a revision to address the problem. Sherryn: Do you have any new projects in the works? Melinda: Laura and I have two paranormal proposals just about wrapped up, one for middle-grade readers and one for YA readers. They should be going out to editors soon. I also have a coming-of-age book out with editors now and I have my fingers crossed one of them will love it and buy it! Sherryn: How can fans contact you? Do you use social media? Melinda: Laura and I have a Facebook page. I am a bad tweeter under melindametz (but I resolve to improve and tweet more). I also have a blog atthemelindametz.com (I always feel that I must say that plain melindametz.com was taken because the “the” seems arrogant!). Laura and I have a web page we are vowing to update over at melindaandlaura.com. I can be reached at the FB page, twitter, and my blog. 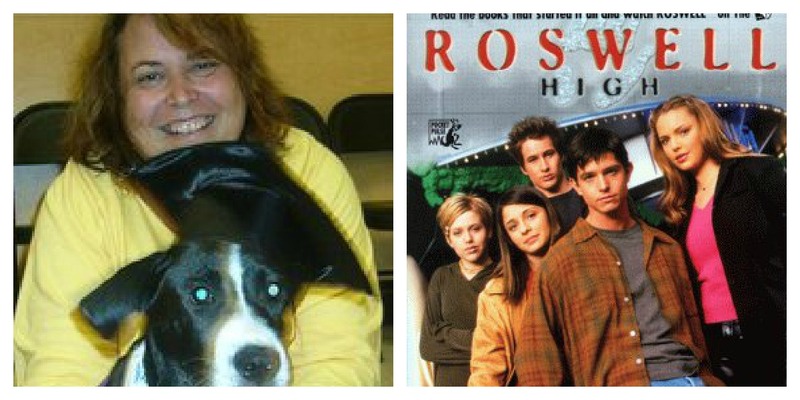 Stay tune for part 2 of my exclusive interview with “Roswell High” author Melinda Metz!